Our go to footwear day in and day out is generally one of two things; classic Vans slip-ons, or Converse All-Stars (either high or low). However, as we get a little older we have an appreciation for items of fine quality. Not to say that Vans or Cons aren't well made, to the complete contrary, but the materials and construction in those icons of footwear has to remain true to the legend and the price point. We came across these "interpretations" of the classic sneaker from new It-brand, Saturdays Surf NYC. 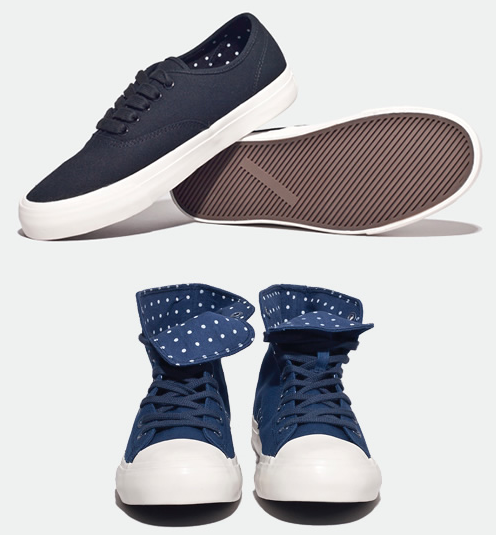 We are totally digging the high-tops with polka-dot lining. You can see more or the brand and these sneakers here.